Dotco 12-20 Series Nibbler is perfect for accessing tight areas, and it is suitable for general industry use. 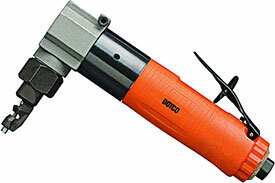 Dotco 12-20 Series Nibbler features durable composite housing. Dotco and Cleco specialty tools assist operators in the worlds toughest industries, offering durability, precision and satisfaction. These tools are constantly evaluated for possible improvements, and each is made with only the best materials available. The 12L2062-96 Dotco 12-20 Series Nibbler is one of thousands of quality tooling products available from MRO Tools. Please browse Dotco 12-20 Series Nibblers for tools similar to the 12L2062-96 Dotco 12-20 Series Nibbler. 12L2062-96 Dotco 12-20 Series Nibbler description summary: Dotco 12-20 Series Nibbler Exhaust: Rear Capacity: 18 ga. Mild Steel Speed SPM: 6 Type Housing: Composite Weight: 1.10lbs / 0.50kg Overall Length: 8.3'' / 211mm Air Inlet Size: 1/4'' Quantity discounts may be available for the 12L2062-96 Dotco 12-20 Series Nibbler. Please contact MRO Tools for details.